We've discovered Aliens ... OK, not exactly Aliens because we found it here on Earth. It's just that what scientists have seen is very unusual. 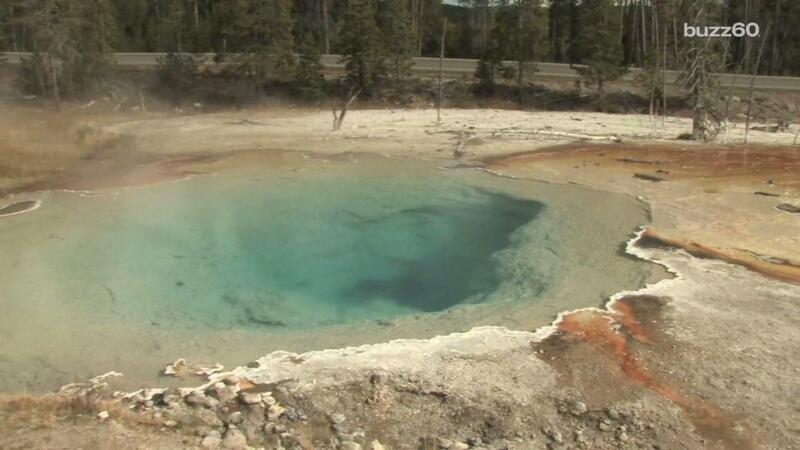 The Department of Energy's Oak Ridge National Laboratory Biosciences Division led a research group to scan the hot springs of Yellowstone National Park. What they are reporting is that they have found a microbe there that first off can live in the hot acidic springs which is not a place for many creatures to survive. That's including us, which we've seen unfortunately with people passing away when they fall off the decks in the National Park. What is interesting beyond that is that the microbe has no cell nucleus or any organelles. It has an open environment exposed cellular membrane and lives through cell to cell contact with a host. It's a specific partnership that is found nowhere else on earth and the Scientists says it could be a blueprint for how alien life could survive in harsh conditions and it could also serve as a valuable model to study the evolution of more complex systems. It really is amazing that Earth is teeming or infested with life around every corner. Some of it lives in acidic and boiling hot vents and some of it takes naps after work. The Haleakala silversword (Argyroxiphium sandwicense subsp. macrocephalum) is a rare plant found only the island of Maui on the dormant Haleakala volcano.Silverswords live between 3 and 90 years or more. They flower once, sending up a spectacular flowering stalk, and then die soon afterward, scattering drying seeds to the wind. Flowering events can differ dramatically from one flowering season to the next. The reasons for that are not understood. Frozen methane bubbles at Abraham lake at sunrise with beautiful sky. A sand dune glows red at last light in this landscape image of the Namib Desert. Colorful mountain in Danxia landform in Zhangye, Gansu of China. The enchanting pools of Pamukkale in Turkey. Pamukkale contains hot springs and travertines, terraces of carbonate minerals left by the flowing water. The site is a UNESCO World Heritage Site. Deep underground cave exploration of Karst cave 'Krizna jama', Slovenia. Roughly 8-9 km long, from 30 to 125 m deep, lots of chambers, siphons, corridors, small islands and roughly 40 lakes, stalactites, stalagmites and other specifical Karst rock formations. Dallol is volcano, Danakil desert, Ethiopia. Snow covered wave taken during cold in Coyote Buttes North. This image was taken in the Fall of 2008 at Tufa State Park, Mono County, Mono Lake, California. This image is very rare as the lake water level is much higher now. I shot this at the cusp of dawn and no filters were used. Zabriskie Point with Panamint Range in distance, Mojave Desert. Mutant nature Zabriskie Point is a part of Amargosa Range located east of Death Valley in Death Valley National Park in California, United States noted for its erosional landscape. It is composed of sediments from Furnace Creek Lake, which dried up 5 million years ago long before Death Valley came into existence. Baobab trees (Adansonia Grandidieri) reflecting in the water under the milky Way, Morondava, Toliara province, Madagascar. Fingal's Cave on the Scottish Inner Hebrides island of Staffa. Rocky cliffs reflected in the calm waters of Horseshoe Lake, Jasper National park, Alberta, Canada. Abstract nature of Lower Antelope Canyon. The canyon is part of a series of slot canyons on Navajo land in Arizona, USA. Nieve penitente is a spike or pillar of compacted snow or ice caused by differential melting and evaporation.